In 1979 artists Bettie Ringma and Marc H. Miller moved from New York City to Amsterdam, and needed a way to support themselves. Remembering a photographer they’d seen selling Polaroid portraits at Coney Island, Miller and Ringma decided to try the same in Amsterdam’s bars and cafés. Over the next year, the two roaming Polaroid-picture-takers became local fixtures: house photographers of the Red Light District and the surrounding urban demimonde. Hearing of their success, the Polaroid Corporation provided a free case of film for them to make and keep extra shots of their most compelling customers. The resulting collection condensed a year of Amsterdam nightlife into a time capsule of colorful characters and period fashion. The exhibition at Stigter Van Doesburg Gallery will feature original Polaroids from 1979 and 1980, and a selection of new digital prints, each in an edition of eight. 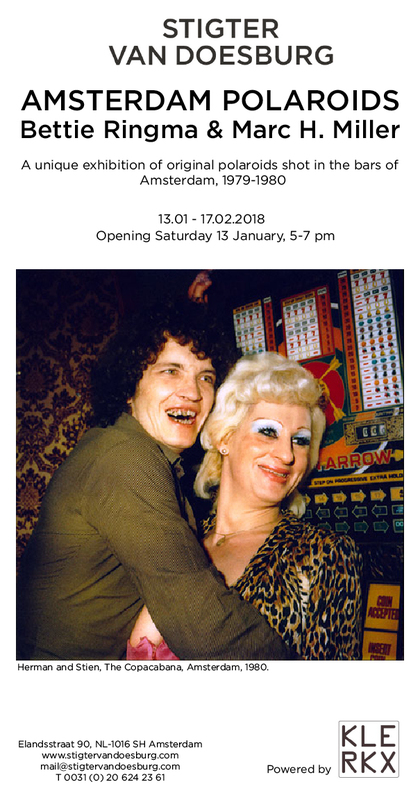 Amsterdam Polaroids opens on January 13 and runs through February 17. Marc H. Miller is the founder of Gallery 98.